"Do penguins have knees?" Good question, Iowa. 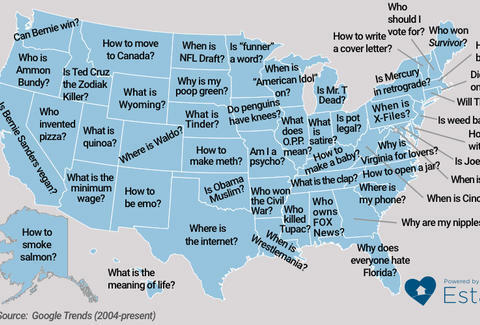 Apparently residents of Kentucky aren't paying attention in health class, because they're googling "How to make a baby?" more than anyone else. 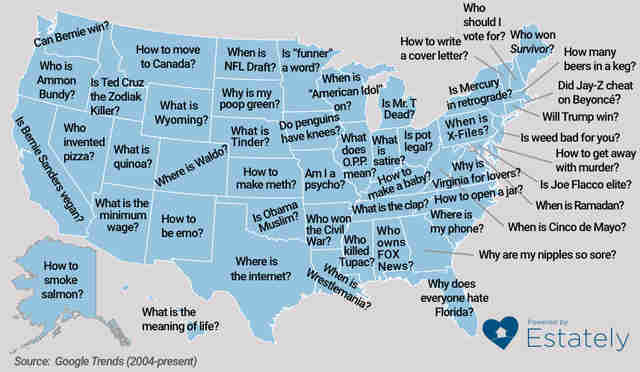 Wyoming is all meta and wants to know "What is Wyoming?." And Florida is self-conscious, wondering why everyone hates Florida. There are even more ridiculous questions in Estately's write up. Meanwhile, everyone in Hawaii is just chilling, contemplating the meaning of life. Yeah, you should definitely move to Hawaii. Kara King is a News Writer at Thrillist and has a lot of questions for Google. Send news tips to news@thrillist.com and follow her at @karatillie.